2017 Ford Fiesta SE 5-Speed Manual 1.6L I4 Ti-VCT 27/35 City/Highway MPG FWD Awards: * 2017 KBB.com 10 Most Awarded Brands * 2017 KBB.com Brand Image Awards Reviews: * Sporty handling when going around turns; well-appointed interior with advanced technology options; peppy and fuel-efficient EcoBoost engine; ST model's zesty performance. Source: Edmunds At Doug Henry of Greenville we offer only the highest quality selection of pre-owned vehicles. All our vehicles go through an extensive pre-inspection process by a team of Factory Certified Technicians. If you can’t find that perfect vehicle you are looking for, please let us know and we will get it for you. Doug Henry is one of the largest dealer groups in North Carolina, we have access to thousands of pre-owned cars, trucks, vans, and SUV’s. Because of our Low Prices and the quality of our pre-owned vehicles Doug Henry of Greenville sells cars all over America. "Ask us about our Delivery Program" At Doug Henry of Greenville we make sure that your car buying process is simple and straight forward. Doug Henry of Greenville is located in the center of eastern North Carolina and just a short drive from I 95. We're 20 minutes from Washington NC, 20 minutes from Kinston NC, 20 Minutes from Wilson NC, and 45 minutes from Raleigh. All prices quoted before sales tax, tags, and 638 admin processing fee. Proud Sponsor of East Carolina University We accept all types of credit from excellent credit, good credit, fair credit, first time buyers, slow or no credit, poor credit, and even bad credit. Best Used Car Dealership You Will Find Anywhere! Proudly serving: Goldsboro, Lagrange, Kinston, Clayton, Smithville, Raleigh, New Bern. 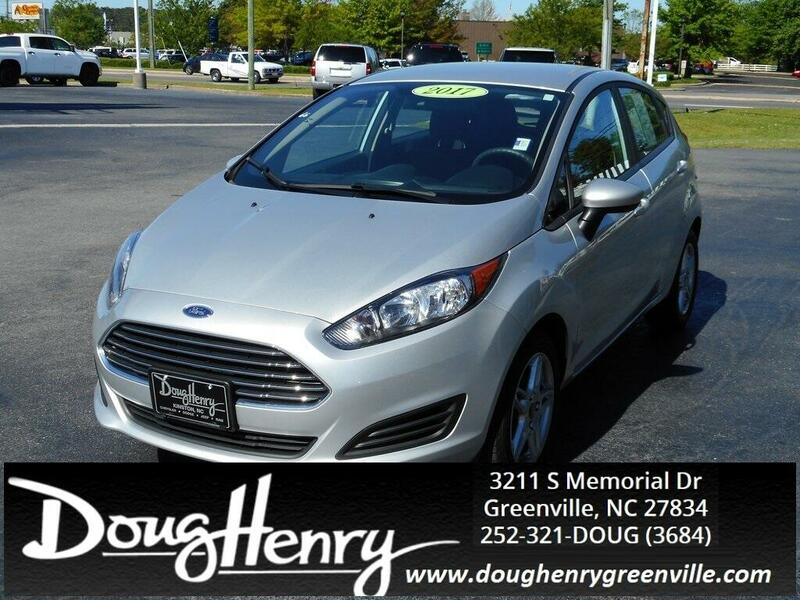 Visit Doug Henry of Greenville online at doughenrygreenville.com to see more pictures of this vehicle or call us at 252-321-3684 today to schedule your test drive. Message: Thought you might be interested in this 2017 Ford Fiesta. Doug Henry of Greenville is not responsible for any typographical errors or third party site vehicle information. It is the customer's responsibility to verify vehicle equipment and features at time of delivery.